July 23, 2018 – The California State University is using multidisciplinary approaches to find ways to mitigate the effects of one of California’s most pressing issues: sea level rise. Faculty are training the next generation of scientists, researchers and conservationists by bringing them into their work to find solutions to an inevitable crisis. 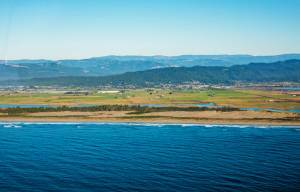 A recent state-commissioned report by CALmatters warns that if drastic changes aren’t made, California’s coastal waters will rise at a rate 30 to 40 times faster than in the last century. Additionally, the U.S. Geological Survey estimates that without concerted intervention, as much as 67 percent of Southern California’s beaches could be lost to rising seas by the end of the century. Humboldt Bay is experiencing sea level rise at a faster rate than anywhere on the west coast, and faster than most places in the world. Because a lot of the bay has been diked off to create agricultural land, coupled with the fact that it is located on a subduction zone, a location where two tectonic plates meets and one slides beneath the other, the land isn’t getting higher as the sea level rises, which is what typically happens to most other coasts. “A lot of the areas that are projected to be inundated with water as the sea level rises are strategically important, like residential areas, gas and electric lines, highways and wastewater treatment plants,” says Richmond. 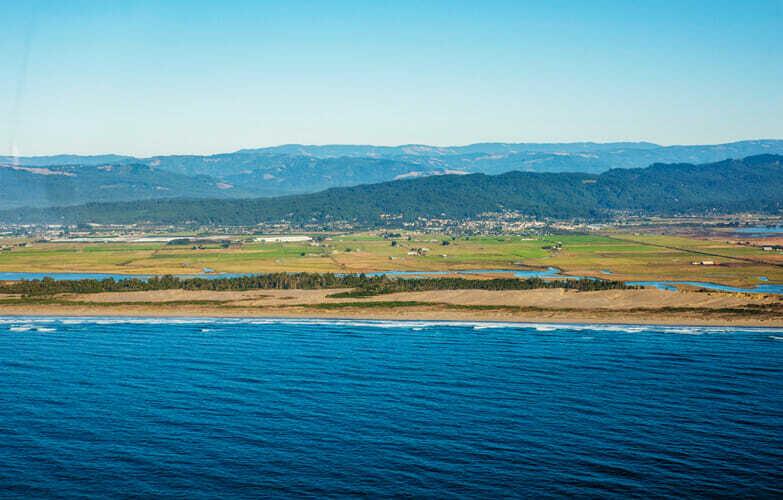 One of these treatment plants is the Arcata Wastewater Treatment Plant, which includes the Arcata Marsh and Wildlife Sanctuary and treats all of Arcata’s water. Eileen Cashman, Ph.D., a professor in the department of environmental resources engineering at HSU, chose to address the challenges facing this area in an annual senior capstone project for her undergraduate students. Cashman’s students were tasked with creating ways to protect the marsh and explored the use of living shorelines, which are soft barriers made of natural material including vegetation, oyster reefs and the slope of the land. Following the project’s end, the city of Arcata, which owns and operates the treatment plant, was able to obtain funding to implement a pilot project that may provide the city with an alternative to relocating the plant. Cal State Long Beach professor Christine Whitcraft, Ph.D., is researching how human activities and climate change impact the structure and functioning of wetlands through her Wetlands Ecology Lab, inviting graduate and undergraduate students to help her and perform their own projects. Wetlands play a vital role in mitigating the effects of sea level rise as they are the first line of defense for many areas. They protect roads, residential areas and communities of plant and marine life that are important to the ecosystem. In 2016, Whitcraft and a team of scientists, engineers and managers organized a large-scale sediment augmentation project in the Seal Beach National Wildlife Refuge to rebuild nesting areas for an endangered bird and help bolster the area against sea level rise, using sediment from a harbor that needed to be dredged so boats could come in and out. Since the project’s completion, Whitcraft and her students have monitored the marsh for signs of recovery. The results so far have been promising, with plants starting to regrow and early re-colonization of animal life happening, proving it may be a viable long-term solution to sea level rise. Cal State Channel Islands Assistant Professor of environmental science and resource management Kiki Patsch is working on several projects through her lab, The Sandshed, aimed at building a coastal collective in collaboration with faculty in several other departments. One of her recent projects, the Beach Sustainability Project, is aimed at developing a way to rapidly assess California’s beaches. Patsch and her students go out every summer to collect data – like its recreational value and its ecological benefits – that give a clearer picture of which beaches serve which purposes. Patsch has developed a mobile application that students will take into the field this summer to help collect and organize this data. The hope is that they will soon be able to roll it out to the public and create a sort of “Citizen Science” project in which people up and down the state will contribute to painting a clear picture of how California’s coasts are adapting to sea level rise. Faculty and students continue to look for ways to help mitigate the effects of sea level rise through research that will help inform policy makers on the importance of identifying and allocating resources for solutions. At HSU, a group of faculty members have launched the Sea Level Rise Initiative through the campus’ Marine and Coastal Sciences Lab, which aims to inform policy makers on possible solutions to sea level rise. Members are also working to inform the public on the potential impact to their communities, especially in lower socioeconomic areas that may be disproportionately affected. The CSU’s Council on Ocean Affairs, Science & Technology (COAST) has been working for the past decade to advance the knowledge of marine and coastal resources and the processes that affect them. COAST supports CSU faculty members and students engaged in marine, coastal and coastal watershed-related research and activities and works to connect members with stakeholders at all levels to promote informed decision-making. Participating in unique research opportunities that benefit California – such as the examples at HSU, CSULB and CSUCI – is a high-impact practice that directly correlates with higher retention rates. It is a key facet of the CSU’s Graduation Initiative 2025, which aims to provide the graduates needed to power California’s economy.